Back (l-r): James Thompson, Fern Cutler, ?, Dixie Mae Poppleton, Emily Carlisle, Evelyn Poppleton, Edith Maw, Delwin Sharp, Annie Thompson, Ed Sharp, Vernal Sharp, Kathleen Sharp, Joy Harms, Howard Ross, Stella Marriott, Iris Adams, Jim Adams, Jim Marriott, Francis Thomas, Devina Thomas. Front: Shelley Mae Tippets, Craig Adams, Mike Adams, Jimmy Adams, J. Golden Draper, Dale Sharp. 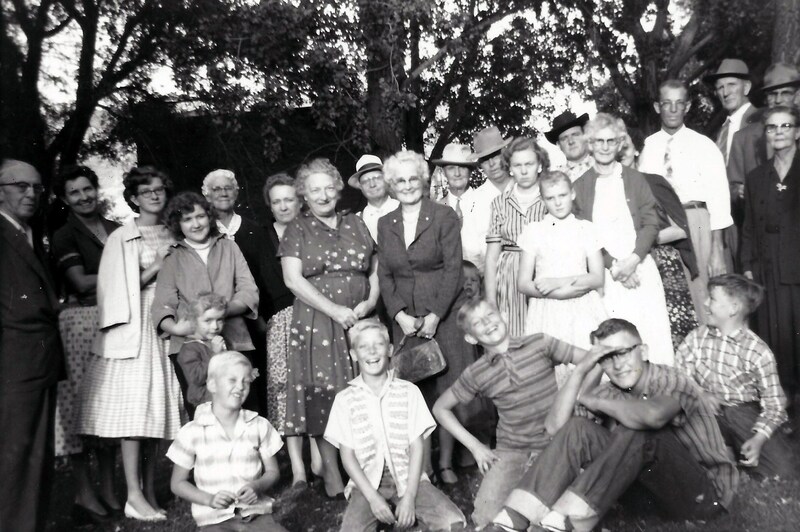 I thought I would make this photo available from the a 31 August 1957 Sharp Family Reunion. There are a few unknowns in this photo. James Sidney Thompson (1888-1964) married Annie Victoria Carlisle (1896-1972). Annie’s grandmother is Isabella Sharp Carlisle (1831-1904). Fern Janet Sharp Cutler (1918-1989) married Gordan Mackelprang Cutler (1917-1991). Dixie Mae Poppleton. Daughter of Edward and Evelyn Poppleton. Emily Stevenson McDonald Carlisle (1886-1975) married Harvey Cartwright Carlisle (1866-1935). Harvey’s mother is Isabella Sharp Carlisle (1831-1904). Evelyn Mae Sharp Poppleton (1911-1977) married Edward Castle Poppleton(1904-1975). Edith Louise Maw (1893-1977). Edith’s mother is Victorine Mary Sharp Maw (1862-1945). Annie Victoria Sharp Thompson (1896-1972) married James Sidney Thompson (1888-1964) mentioned above. Edward Sharp (1887-1962) married Lillie Elva East Sharp (1888-1942). Vernal LaVane Sharp (1908-1971) married Kathleen May Nelson Sharp (1920-2008). Kathleen May Nelson Sharp (1920-2008) married Vernal LaVane Sharp (1908-1971). Joy Harms daughter of Kathleen May Nelson Sharp from her previous marriage to Harry Harms Jr (1906-1945). John Harold Ross (1923-2004) married Colleen Fowers Hancock Ross (1929-1969). Estella “Stella” Inez Thomas Marriott (1884-1964) married James Oliver Marriott (1881-1965). Stella’s mother is Anne Elizabeth Sharp Thomas (1852-1891). Iris Maud Sharp Adams (1920-2001) married James Vester Adams (1913-1984). James Vester Adams (1913-1984) married Iris Maud Sharp Adams (1920-2001). James Oliver Marriott (1881-1965) married Estella Inez Thomas Marriott (1884-1964). Francis Milo Thomas (1875-1962) married Isabelle Divina “Devina” Nicol (1878-1975). Francis’ mother is Anne Elizabeth Sharp Thomas (1852-1891). Shelley Mae Tippets (1952-2008). Granddaughter of Edward and Evelyn Sharp Poppleton through their daughter Sharon (not pictured). Back (l-r): Mae Poppleton, Ernest Sharp, Nelda Miller, Ed Howard, Ed Poppleton, Martha Howard, Violet Sharp, Vic Maw, ? (behind Vic), Mary Richardson, Mary Kley, ?, ?, Emma Howard, Eli Howard, ?, Vic Hunt, Ray Sharp, ?, Os Richardson. Middle: Opal Stolberg, Carma Mercer, Lilly Sharp, Aus Sharp, Lewis Kley, Martha Howard, Del Sharp, Fred Hunt. Front: ?, ?, Ruby Sharp, ?, Harold Ross, Howard Kley, Ruth Kley, Verla Kley, Elda Kley, ?, ?. Here is a photo from a Sharp/Howard family reunion in about 1933. If anyone can name more, I would be happy to update the names and information. Evelyn Mae Sharp (1911-1977), wife of Ed Poppleton, daughter of Del and Violet Sharp. Ernest Sharp (1886-1967), son of Milo and Lilly Sharp. Nelda Sharp (1914-1985), daughter of Austin and Martha Sharp. Edward Castle Poppleton (1904 – 1975), husband of Evelyn May Sharp. Martha Hazel Howard (1886-1965), wife of Austin Sharp, daughter of John and Martha Howard. Violet Grieve (1891-1964), wife of Delwin Sharp. Victorine Mary Sharp (1862-1945), sister to Milo Riley Sharp. Mary Irene Sharp (1892-1990), wife of Oscar Richardson, daughter of Milo and Lilly Sharp. Mary Susan Howard (1896-1964), wife of Lewis Kley, daughter of John and Martha Howard. Melva Ladean Howard (1926-2009), daughter of Eli and Emma Howard. Emma Dean Allred (1902-1992), wife of Eli Howard. Jesse Eli Howard (1902-1985), wife of Emma Allred, son of John and Martha Howard. Victorine Sharp (1889-1987), wife of Fred Hunt, daughter of Milo and Lilly Sharp. Milo Ray Sharp(1880-1946), son of Milo and Lilly Sharp. Oscar Child Richardson (1889-1971), husband of Mary Sharp. Opal Adaline Sharp (1909-1995), daughter of Austin and Martha Sharp. Carma Lillian Sharp (1912-1981), daughter of Austin and Martha Sharp. Lillian “Lilly” Musgrave or Mary Ann Stoker (1861-1935), husband of Milo Riley Sharp, I have written of them previously. Austin Sharp (1886-1956), son of Milo and Lilly Sharp. Lewis William Kley (1891-1963), husband of Mary Susan Howard. Martha Adaline Graviet (1869-1941), wife of John George Howard. Delwin Sharp (1884-1969), son of Milo and Lilly Sharp. Fredrick Lawrence Hunt (1887-1967), husband of Vic Sharp. Ruby A Sharp (1922-Alive), daughter of Edward and Lilly Sharp. John Harold Ross (1923-2004), raised by Del and Violet Sharp, their nephew. Howard John Kley (1920-2001), son of Lewis and Mary Kley. Ruth Delone Kley (1926-2004), daughter of Lewis and Mary Kley. Verla Adaline Kley (1919-1989), daughter of Lewis and Mary Kley. Elda Mary Kley (1924-2005), daughter of Lewis and Mary Kley.